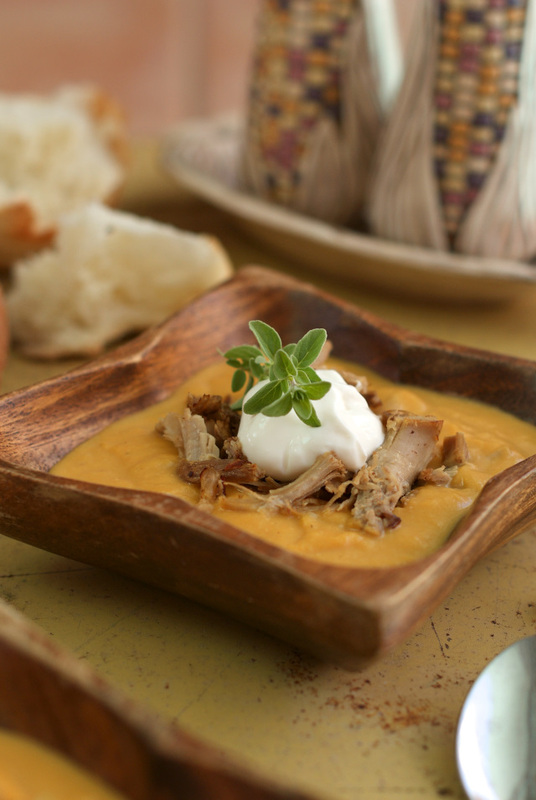 Roasted Butternut Squash Soup with Shredded Turkey is a silky, smooth, and comforting soup that is elevated by topping it with shredded turkey, sour cream, and a sprinkling of fresh herbs. There are certain recipes that just scream fall. This soup is definitely one of them! To me, butternut squash has the taste of fall, the color of fall, and goes perfectly with hearty and comforting roasts as a side dish. I picture eating butternut squash on chilly nights when you want your food to warm you up. For this soul-satisfying soup, butternut squash takes the spotlight. It is roasted in the oven until it is gorgeously caramelized, blended until it's silky smooth, and then paired with earthy onions and garlic. It's smooth, savory, and absolutely fantastic. Now, the butternut squash soup is amazing on its own, but for this particular recipe, it is topped with a few extras that really take it over the top in the delicious department. First, there's shredded turkey. Turkey is another one of those foods that just feels like fall! 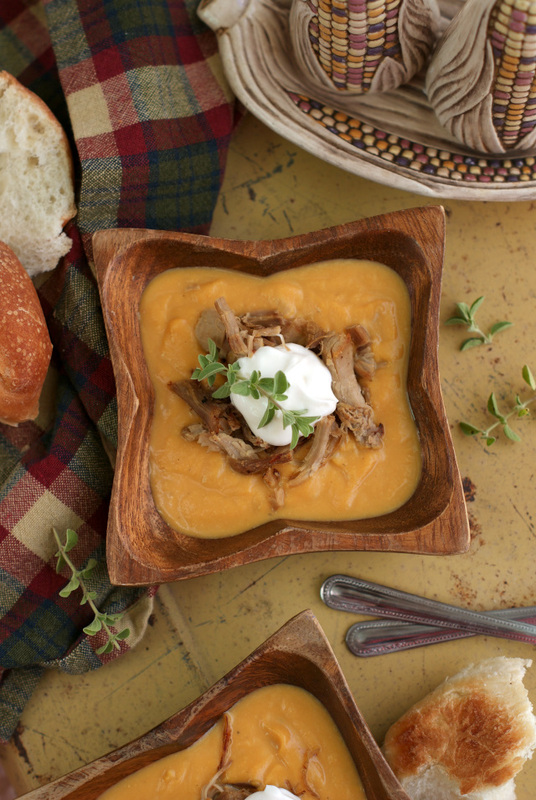 This recipe it the perfect way to use up your leftovers from Thanksgiving. Then, a little scoop of sour cream and a sprinkle of fresh herbs round everything out. I got this recipe from my sister Kari, who made a big batch one night a few weeks back. She had lots leftover, so she wrapped up little to-go packages and then delivered them to friends and family, including me! It was such a kind gesture and from now on when I think of and enjoy butternut squash soup, it will not only warm my body but my heart, too. Thanks, Kar! Preheat oven to 425 degrees. Cut squash in half lengthwise and remove seeds. Rub the cut side of the squash with 1 tbsp of butter. Season with salt, pepper, and 1/2 tsp garlic powder. Roast, cut side down, in preheated oven for 1 hour, or until the flesh is caramelized and soft. When cool enough to handle, scoop the flesh from the squash into your blender. Add 2 cups of turkey stock and the evaporated milk to the blender and blend until smooth. In a large skillet over medium-high heat, cook the onions and minced garlic in the remaining 3 Tbsps of butter until softened and beginning to caramelize. Add 3/4 cup of white wine to the skillet and simmer for 5 minutes. Pour the blended squash into the skillet with the onions and garlic, bring to a simmer. Reduce heat to low and season with remaining 1/2 tsp garlic powder, salt, and pepper to taste. When ready to serve, top with shredded turkey, sour cream, and fresh herbs. Source: This is my sister Kari's recipe. Thank you so much for sharing! My sister's recipe calls for a white wine turkey stock. You can also use vegetable stock or chicken stock. Additional herbs and spices can be added to suit your tastes. Nutmeg, cinnamon, and ground cloves are popular additions to butternut squash soup.